The Microchip ATA663232 system basis chip is a fully integrated LIN transceiver, designed according to the LIN specification 2.0, 2.1, 2.2, 2.2A and SAEJ2602-2, with a low-drop voltage regulator (3.3V/85mA) and a high voltage wake-input. The combination of voltage regulator and bus transceiver makes it possible to develop simple but powerful slave nodes in LIN bus systems. 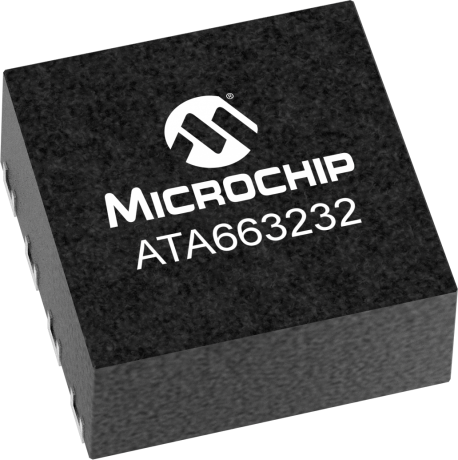 Microchip ATA663232 is designed to handle the low-speed data communication in vehicles (for example, in convenience electronics). Improved slope control at the LIN driver ensures secure data communication up to 20Kbaud. The bus output is designed to withstand high voltage. Sleep mode and silent mode guarantee minimized current consumption even in the case of a floating or a short-circuited LIN bus. The voltage regulator is a fully integrated low-drop voltage regulator, with 3.3V output voltage and 85mA current capability. It is especially designed for the automotive environment. A key feature is that the current consumption is always below 170µA (without load), even if the supply voltage is below the regulator's nominal output voltage. ATA663231A-V1.2 is an evaluation tool for a quick start with s 4th generation LIN SBC including LIN transceiver + low drop 3.3V/85mA voltage regulator enabling easy prototyping and testing.